In the summer of 2013 I went to the old city of Gent. Like many cities from the Middle Ages this Belgian city was built around its castle, church and market place while a big canal initially served as a first line of defence. After the canal a series of walls and towers follows. I like this picture. When you look ahead across the water you see different houses from different periods. The old Belgian cities, in particular the Flemish cities did not become as wealthy as Amsterdam and the other Dutch cities. In these sometimes abandoned cities time stood still for ages and nothing changed. 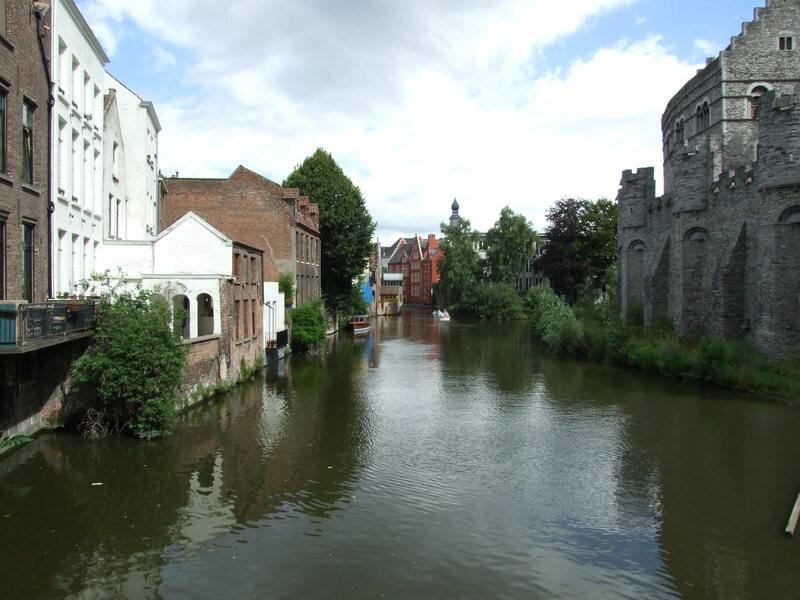 Gent changed a little but many of its historic buildings stayed in good condition. The old city centre is pretty much a museum. Sometimes the visual and tactile cues are overwhelming. It is a good thing you can walk around and just enjoy being there. Sometimes museums were so overwhelming I just wanted to leave. A city that lost its old city centre completely is Rotterdam. In the Second World War the German bombers reduced the old city to ruins. In the decades after the bombing and Second World War Rotterdam transformed into a modern and somewhat uninviting city. The old centre is mostly tarmac and modest sky-scrapers. It is a good thing the history of many old cities and regions I know is kept alive. Some of the stone faces of the old buildings are remnants of the media-evil origins to European democracy. In Holland the Dutch fought the water and in the dryer regions the cities fought for independence through cooperation and mutual civilian interests. Cities, especially the trade oriented cities are often seen as cultural meeting points and incubators. There people met and exchanged ideas and experiences. The old architecture, works and libraries are usually still accessible. Fantastic submit, very informative. I wonder why the opposite experts of this sector don’t understand this. You must continue your writing. I’m confident, you have a great readers’ base already! Thanks for another fantastic post. The place else may just anybody get that type of info in such a perfect means of writing? I’ve a presentation next week, and I am at the search for such info. We’re a gaggle of volunteers and opening a new scheme in our community. Your website provided us with useful info to work on. You have done a formidable job and our entire community can be grateful to you. If anything, visit the old cities and enjoy the surroundings.